So now comes the time to reflect on the current year and plan for the following year. 2012 was a good year for me, overall. I released a novel and a novella, with a short story due to be published before end of year. 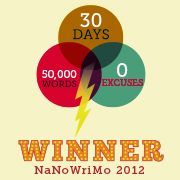 I also completed the NaNoWriMo challenge, ending with 50,326 words. I’m 11,000 words or so into my second Badlands book too. I also fully revised Into the Badlands, cleaning up a lot of my clunky “newbie” narrative. Adding up all the words written (and excluding the Badlands revision), it comes to 157,000 words in 2012. Combined with last year, that’s nearly 300,000 words, almost one-third of the way to my first million words. Hard to believe. What’s to come? Well, I first have to finish book two of my Badlands trilogy. A trilogy, you ask? Not simply a sequel? ‘Fraid so. After outlining the sequel I found that one character’s story just didn’t have a proper ending. It soon became clear to me that this person’s story needed another novel, so the idea of a trilogy came to mind. Besides, a trilogy will be fun. I think the third book will be called Reclaiming the Badlands, but we’ll see. Once Beyond the Badlands is finished, I’ll be back on The Crossover Gene. I wrote half of the first draft for NaNoWriMo, so I already have a leg up on completing the novel by the end of 2013. That’ll probably be all I can squeeze in during 2013, since I’ll already be pushing myself to meet these goals. But, if I get ahead of the curve, I might just do the NaNoWriMo challenge again. I already have an idea of the novel I might write. This also marks the two year anniversary of my return to writing. Amazing things have happened over the past couple of years and I hope next year is even more amazing. With the right amount of hard work and luck, I think it will be. It wasn’t exactly tearing up the charts, but it was moving a few copies. It stayed this way for a solid couple weeks, selling barely anything. I have noticed a gradual increase over the past couple weeks, particularly over the past seven days or so. If I didn’t know better, it seems to be building momentum with a bit of a snowball effect.